If anybody can be described as a born poet, then Tera Fabianova must be a strong candidate. 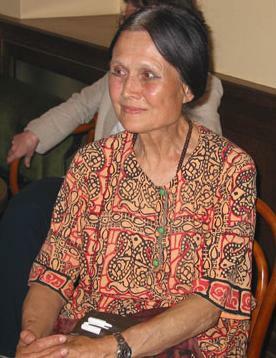 Although she left school at just eleven, she was fluent in four languages, and her poetry and stories are unmatched in the way they take the rhythms of the spoken word and draw out their lyrical potential - whether in Czech, Hungarian or her native tongue: Tera, who died in March at the age of 76, was a Romany, and much of her work was written in the Romany language, spoken in various dialects by Europe's Roma communities for many centuries. Here is a translation of one of her poems that became very familiar a few years ago to people travelling in Prague's metro, when it featured in the project "Poetry in the Underground". Through my children's little hands. Dare I hope for more? What can I owe the Devil? Even a twisted tree gives shade. A couple of years ago I spent an unforgettable afternoon with Tera at her little flat on a Prague housing estate, visiting her along with her old friend, Milena Hubschmannova - the Czech Republic's foremost scholar of the Romany language. The two had been close friends for fifty years, but sadly both have since died, marking the end of an era for Romany writing. I was glad to have recorded much of our conversation. Talking with Tera, you were never quite sure when she was reciting a poem, and when she was just talking to you. Songs and poetry formed part of the flow of her conversation. As we talked, she soon broke into a song she had written in Hungarian. The words, she said, were about herself. What good would it do me? 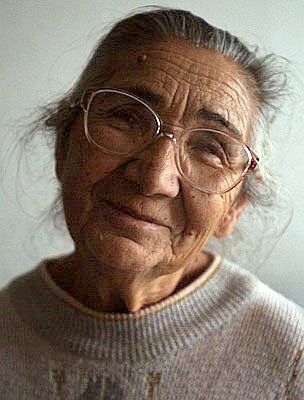 Tera Fabianova was born in 1930 and grew up in a Romany village in Southern Slovakia, one of ten brothers and sisters, in a house made of unbaked bricks that their father had built with his own hands. She went to school for just three years. "No-one in my family could read and write. I would go and work as a little girl for the Gadjo for a piece of bread and lard. One day they came to tell us to go to school. 'One from each family must go to school or you'll be locked up.' My mother said, 'You'll go 'cos you're naughty.' I climbed trees and was a real tomboy. My mum washed my head and feet and I went off to school. "I sat in the first row, because I wanted to be clever, and near the teacher. I didn't have a pencil or paper or anything. I sat and waited for the teacher. She came and said, 'Hey, you, Gypsy kid. Your place is at the back.' There were three benches where the Romany and poorest children sat. I wasn't allowed to sit at the front. But I wanted to be clever, wanted to learn." Tera later immortalized her memories from school in her autobiographical story "How I Attended School". The teacher made me suffer. When my little sister Helena was born I was at the birth. I saw the miracle of someone being brought into the world. The midwife told me to bring water and cloths. It was cold and I helped to bring Helena into the world. We didn't have running water, I had to go to the well, I had to cut wood for the midwife. The next day I went to school. We had Catechism - I sat down. Because I hadn't slept all night, I fell asleep. The priest said - hey, you bighead - because I had lots of hair - tell me how Jesus was born. And I said - Father, you've never seen it, but I was there when our Helenka was born. He gave me ten slaps with the cane on my bottom and on my hand. And he sent me off to the church to pray. 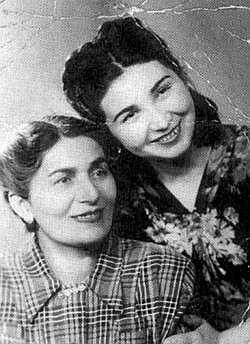 After the Second World War, which had brought immense hardship to Slovak Roma, the family went to work in what is now the Czech Republic, and Tera met and married her husband Vojta. They were to have four children. Their eldest son, also Vojta, has inherited his mother's musical talent and is a well-known musician singing both in Czech and Romany. The family never had it easy. Tera worked with her hands all her life, starting from the age of five, when she would chase crows from the fields. Although she won numerous literary awards, she would just laugh when someone described her as a writer. In Prague in the 1950s she qualified as a crane driver for the huge engineering plant CKD, and even in her seventies she was working as a cleaner, to help pay the rent. These experiences found their way into her writing. Her factory work was dangerous and on one occasion she nearly died, after inhaling dangerous chemical vapours. That experience is in one of her first tales "Dream of a Gypsy": a Romany crane operator experiences clinical death after an accident. He goes to heaven, where he expects Roma to be treated as equals with everyone else. How surprised he is when he sees a special entrance for Gypsies. Everything is the same as on earth - even in heaven the Roma do not have the same rights. This story, one of her first written in Romany, was broadcast on Czechoslovak Radio in the mid-1960s, and gradually Tera became better known. At the time she was a pioneer of writing in the Romany language, and when we visited Tera, Milena Hubschmannova remembered those beginnings. "We were going somewhere by car, and all of a sudden she started not to recite but to shout a poem. It was so beautiful that I immediately stopped, and I took a paper and pencil and I asked her to repeat it. So she repeated it, with a little variation, but not much, and I put it down. It's like the habit in India, when holy poets, sometimes have modest disciples who put down what they are composing. So I put her poem down." Or bring you pain or shame. The fiddler will strike up a tune. We are not poor, though we have nowhere to lay our heads. There I shall lay you down, when the silver night comes. And if you happen to feel cold, I shall call the heavens to cover you. As the black earth loves the black bread. "She was composing poetry before, but never in Romanes - always in Hungarian, because Hungarian was her second mother tongue. It think it was her first poem in the Romany language. And the fate of this poem is that then it was published in a bilingual booklet, which was really the first written book published in Romany. 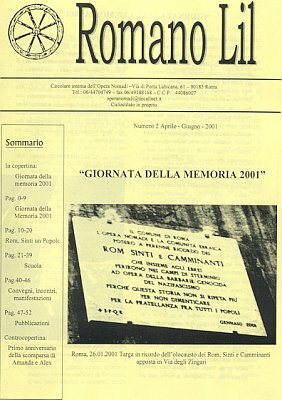 It was a selection of poetry by around seven Roma who were writing. "I recited this poem to Margita Reiznerova. She is an excellent poet too. Unfortunately she lives in Belgium now - she is quite dark and was afraid of skinheads - so the whole family emigrated to Belgium in 1996. I showed this poem to Margita, but this was the first time that she had ever seen Romany written down. So it didn't mean much to her. And then I recited the poem to her. She was so impressed that in two days she brought two poems of her own. And it was not just Margita. There were other women as well. "There was a Union of Roma in the period of the Prague Spring (in 1968). At that time Roma were allowed to found their own organization. There was a journal Romano Lil, and Tera had her column. She was writing about the real problems of Roma at that time. First of all she was appealing to young Roma that they shouldn't forget the Romany language. And then she was writing about the relationship between husband and wife, between men and women, and that wives shouldn't let themselves be downtrodden by men, and that they should be proud. "Once I came to Nachod, a town in North Bohemia, and there was a twelve-year-old girl called Olina. I asked her, 'What would you like to do when you grow up?' She told me, 'I would love to be like Tera Fabianova.' And I asked her, 'Do you know Tera Fabianova?' She said, 'No, I've never met her, but I was reading what she was writing. I was reading her small articles. And it inspired me so much that now I am proud that I am a Romany and I would love to be like Tera." Tera died on 22nd March this year. With her immense charisma and generosity she will be hugely missed, but her legacy will live on. Today there is a growing canon of Romany writing, much of which is built on Tera's Fabianova's pioneering work.